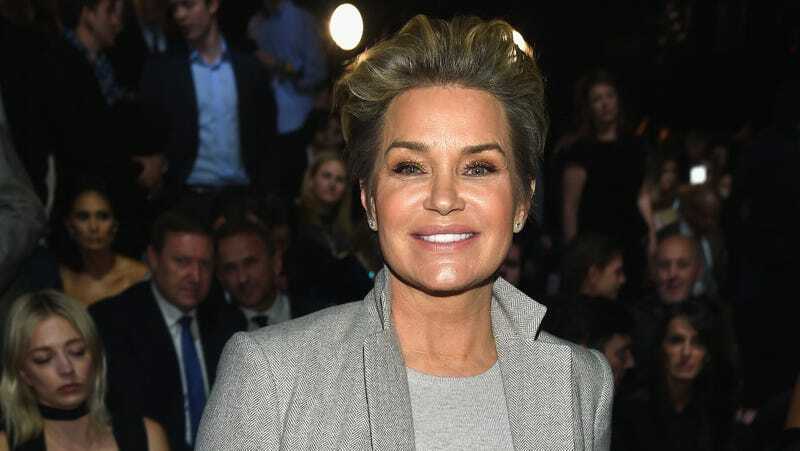 The artist formerly known as Yolanda Foster is taking her lemons and white denim and getting the hell out of dodge, never to return to reality television again—unless she gets a spinoff or needs to buy another Malibu mansion. Yolanda (who is back to using Hadid) announced via Instagram that after four seasons, her Real Housewives career has come to an end. In a lengthy caption, Yolanda tries to act like she didn’t have one foot out of the door last season anyway and also pretends like she doesn’t now hate all of the housewives except for Erika. You could have called this one. Her actual personal issues aside, Yolanda’s entire storyline last season was about her illness, which is sad, for sure, but not the most compelling television. If it weren’t for the other women acting like deranged parrots who watched one episode of Dr. Oz, we probably wouldn’t have talked much about her Lyme at all. There’s also the fact that as her marriage to David Foster was crumbling, she barely acknowledged it on camera. Again, that makes sense for someone with their priorities remotely in order, but a Real Housewife’s gotta Real Housewife, ya know? Goodbye Yolanda, you will be missed. When you burst onto the scene I wondered if we had finally found the definitive Greatest Real Housewife ever in you. You were ostentatiously wealthy and beautiful and engaged with the drama just enough to be interesting, but rarely to the degree that it made you look like a psycho. You willed your children into supermodels, doted on your very rude husband, did all kinds of weird things to your body, possessed one of the most absurd refrigerators on the planet and sprinkled the other women with condescension—and you did it every step of the way with a ripe lemon in your hand. Let us now honor Yolanda with this video where puts on her best Dutch Martha Stewart impression and riddles her beachside palace with lemons.